This morning I’ve been busily linking away so that I can show you some of the great things currently happening around the world that involve our sewing patterns. It’s so rewarding to see what our patterns have inspired. Matt and I may not have time for an in depth sew-along for every single pattern (though, we do have more planned, don’t worry! ), or to sew up the millions of different cardigan’s, pants and henleys I have swirling around in my head, but that is okay because there are many other people out there who are doing exactly those things! If you are a Spanish speaker then you really are in luck – our Spanish stockist, Telaria, is mid-way through a thorough and easy-to-follow sew-along for the Newcastle Cardigan pattern! Even if you don’t speak Spanish, you might want to make use of Google Translate and have a look at all the hard work Miren has put into documenting her Newcastle Cardigan sewing process. We are thrilled that she has taken this large project up and love how her cardigan turned out. Once you’ve had a look at the Telaria “Just for Men” sew-along, make sure to add your Newcastle to the Flickr group that Miren has set up! If you enter your photo by March 17th you will be entered in the draw for a chance to win one of three awesomely manly prizes (including manly fabric, a Japanese menswear pattern book and even some of our patterns). Even though you missed the beginning of the Newcastle Cardigan portion of the sew along, you still have time to get ready for the third segment of the “Just for Men” series. The Strathcona Henley sew-along will begin on March 3rd. If you are nervous about sewing with knits, this will be an invaluable resource for you! The next thing I want to share with you is a brand new blog called Tinker, Tailor, Sewster…Spy? created by a male sewer based out of Brisbane, Australia. He began his blog to document his Jedediah Pant sewing process and also has plans in the works to sew up the rest of our Parkland Collection. He is a very careful and thorough sewer who seems to have an endless pool or patience to pull from. His most recent blog post details his decision to scrap his original plan to use bright blue top stitching (pictured below) and instead switch to gray. 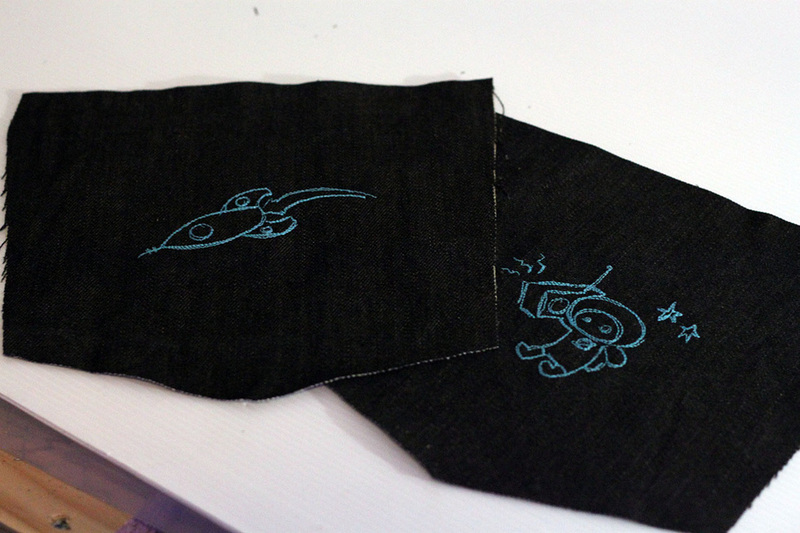 This means he will be redoing the back pockets that he embroidered, blogged about and even filmed! I really admire his commitment to making the perfect garment. After all, why put all that effort into sewing if you are only going to produce something that you aren’t really happy with? To me, this is one of the most rewarding parts of sewing menswear. Since menswear is dictated by details and fit, imperfection in either of these areas will stand out very obviously in a finished garment. While it might be incredibly frustrating mid-sewing process to re-do top stitching over and over again or to make multiple mock-ups, the result is something that is very easy to feel proud about! You would never guess that the author of Tinker, Tailor, Sewster…Spy? is new to blogging – his posts are full of information, inspiration, lots of photos and videos. Head on over to comment, follow his blog and encourage him in his new blogging endeavor. It is great to see another male sewer join the sewing and blogging community! Good luck to him on his quest for the perfect Jedediah Pants! Last but certainly not lease in today’s parade is a new project from the most prolific Thread Theory customer: Huff Makes Stuff. I can’t believe how many Jeds and Straths Jen has whipped up over the last few months! Her goal is to create a new outfit for her husband and herself each month for 12 months. She has already completed four outfits for her husband which include four Jedediah Short and Pant variations and four Strathcona Henley, Sweater and T-shirt variations. I love how her husband’s taste for colour and print is displayed in each outfit and I especially love how all of these garments display how versatile these two patterns are. Each outfit looks well planned and stylish and must make Darron’s wardrobe very easy to pick from each morning! The latest outfit is wonderfully summery and bright and makes a nice Australian contrast to the dark mid-winter renditions of the patterns that I always sew. She has mixed and matched the Strathcona variations to create a short sleeve henley without buttons. She is toying with the idea of adding buttons to the placket but I think she should leave them off because I love how casual and cool it looks – perfect for a day at the beach or on the backyard patio! 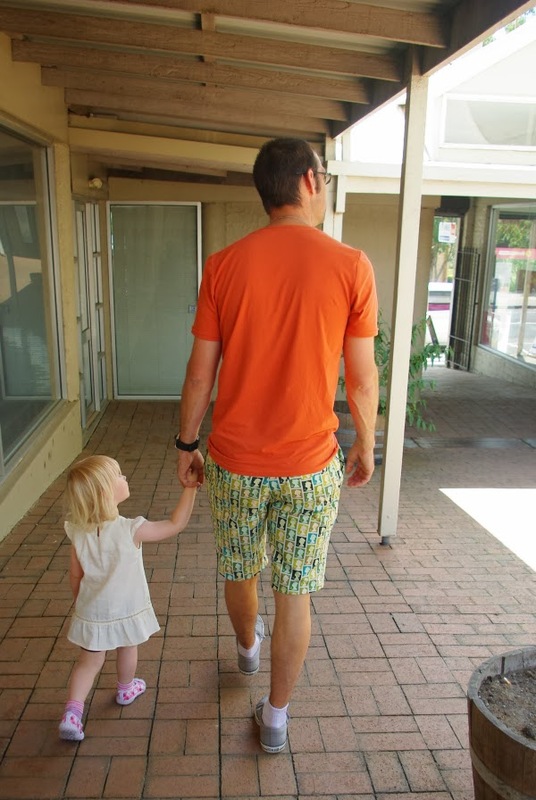 She has paired this orange henley with awesomely out-there postage stamp Jedediah Shorts. 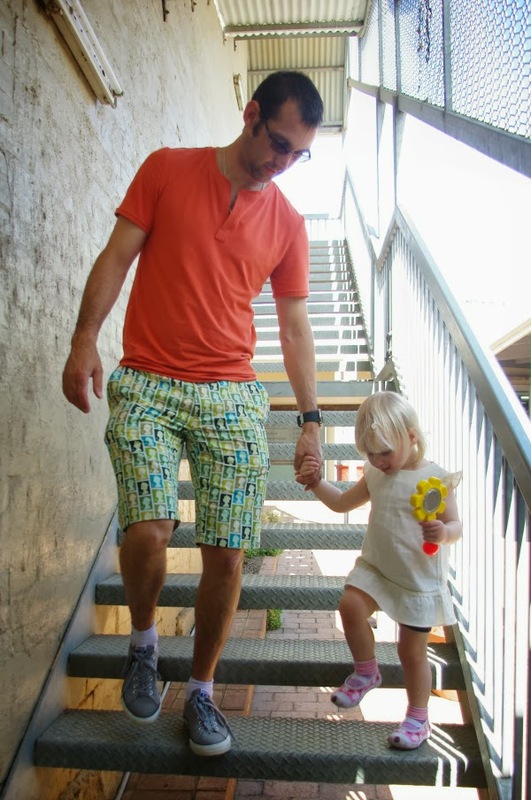 Her husband is fearless when it comes to prints (Matt has something to learn from him – he even steers clear of stripes!). She made the legs slightly less tapered and did not cuff this version of the shorts. Check out all of her outfits (both those sewn for her husband and those she’s sewn for herself) to see how rewarding an organized outfit-oriented approach to sewing can be! Do you have any menswear projects, blog posts or tutorials to share with us? We would love to feature them on the blog! Send us an email at info@threadtheory.ca to let us know what you have been working on. Categories: Friday Posts, Jedediah pants, jedediah shorts, Showcase, Strathcona Henley, Strathcona T-shirt | Tags: menswear bloggers, sew along | Permalink. Thanks for the shoutout! We’ve been having so much fun playing with these patterns! We’re thrilled you’ve been enjoying them so much! great stuff out there! i finished up a pair of jedediah pants recently, but the husband had to go out of town before i had a chance to photograph… they turned out great though! I look forward to seeing them when you get a chance to do your photo shoot. I’m glad they turned out well!